Michael Hawk is a freelance reporter. This is one very strange series to describe. 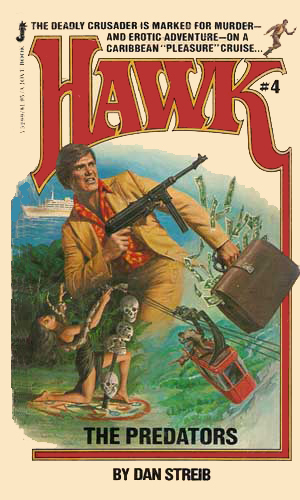 As it deals with international intrigue and is chock full of spies, it is included in this compendium even though Hawk is not an secret agent. He is, however, as a reporter who has traveled the world and written several damning exposes, earning the wrath of some very powerful people including the KGB. He is also incredibly wealthy, sort of. 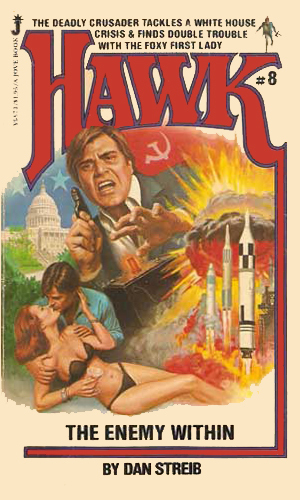 At the beginning of the series, told in the first volume, Hawk is a man recently released from a Soviet prison where he was investigating the cruelty he knew to be there. Soon, however, he is intrigued with rumors of a recluse on a Greek island and heads there to investigate. It is impossible to describe the basis for the remaining 13 books without giving away the ending of the first so here goes. The recluse is a beautiful woman who had inherited a gigantic fortune spread all over the world from her father, a deposed dictator. She is reclusive because the Soviets are the ones who kicker the leader out of his country and they want the vast wealth for themselves. Hawk's investigations into her past come to the attention of the KGB and bring about her tragic death. Almost as a curse as she lay dieing from an assassin's bullet, she passed on to Hawk the secret account number needed to unlock the wealth. Now he is the holder of the tremendous power the money brings and he knows he can use it to do good. He is also the target of the Soviets who still want what is left over and are not afraid to kill to get it. The only other one who knows the secret behind Hawk and his wealth is a key agent of the CIA who seems not above pushing Hawk into helping out now and then. 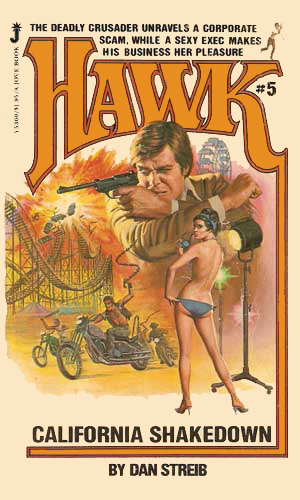 By the way, the tag line of 'crusader' comes not only from Hawk's natural predilection for champing various causes but also for the name the dictator had given the corporation controlling most of his money - Crusaders, Inc. 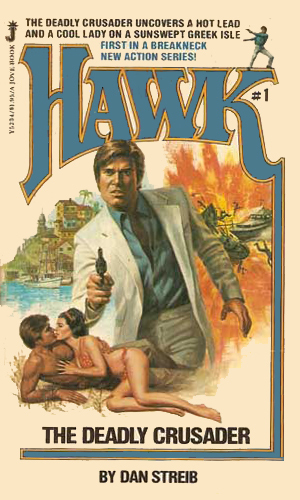 Rumors of a secluded Greek isle where a wealthy recluse lived bring Michael Hawk to investigate and into a fight by the KGB to reclaim an ex-dictator's vast fortune. 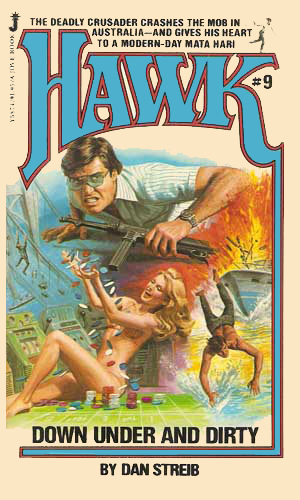 Reeling from the new power he has just come into, Michael Hawk is ill prepared to take on a cult lead by a madman and controlled by a wife with visions of total control. A man wanting to become the controller of all electricity in the U.S. is sabotaging nuclear plants, including one owned by Michael Hawk who doesn't take kindly to the trouble. Michael Hawk sails into the Caribbean and into the arms of a mother-daughter team unlike any he had ever met, as well as an assassin determined to kill him. While investigating the murder of an old friend, Michael Hawk lands up in Hollywood and discovers a rotten scam going on among the dream makers of Tinseltown. Wanting to know why a reporter was brutally killed in Venice, Michael Hawk finds old Nazi hatred and schemes still smoldering behind the walls of a huge palatial villa. Michael Hawk visits a friend who runs a motorcycle circus just as he is killed in a fiery crash, with plenty of evidence showing it was not an accident. The President of the US, an old friend of Michael Hawk, is fearing he is losing his mind and needs help even as the Mid-East is ready to explode. 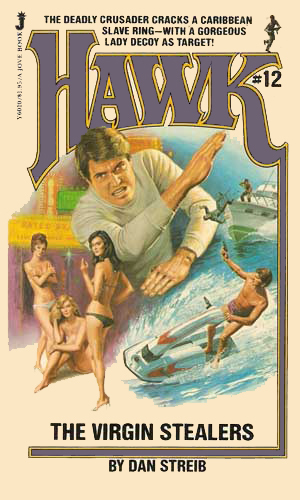 Someone is trying to take over Sydney's organized crime and Michael Hawk is hot on the trail. The crime bosses don't want publicity, however, as they start to fight back. 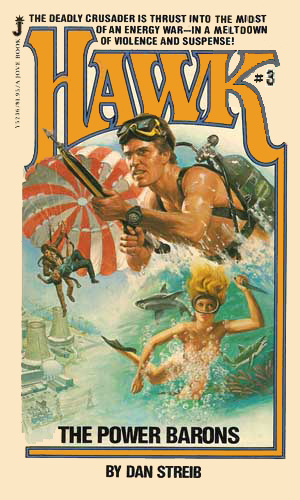 When Michael Hawk finds a tropical island for sale, he figures this would be the perfect refuge but the CIA and KGB seem to have other plans, as does a powerful hurricane. Michael Hawk heads to New York to take on a terrorist group that has attacked several times in several ways and is setting the scene for an even greater calamity. 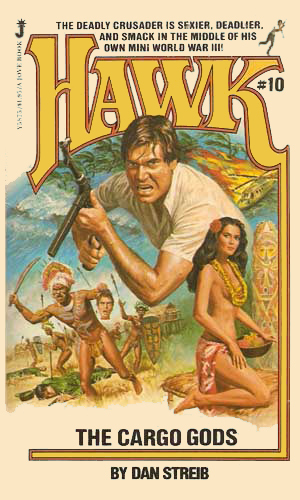 The disappearance of Michael Hawk's date for the evening leads to his discovery of a white slavery ring in the Caribbean but why was the CIA trying so hard to mislead him? 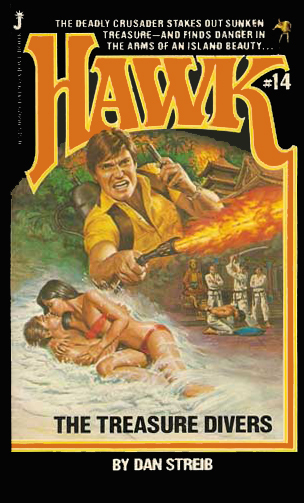 While in Hawaii, Michael Hawk takes exception to the murder of a friend by a Chinese gang called the Way and learns that the Way is planning a takeover of the islands. 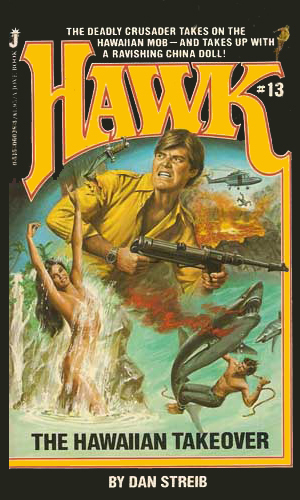 Michael Hawk wants to know who would take an old man's delusion about being the only survivor of a WWII treasure boat serious enough to kidnap him from an Hawaiian resort. 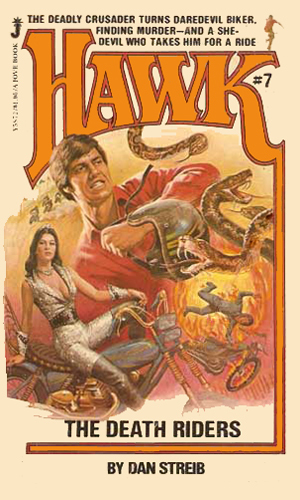 This series got off to an unbelievably rough start with a first book that made very little sense except to set the scene for several other more enjoyable adventures. After that, the tales became smoother and easier to follow, if not quite standard. 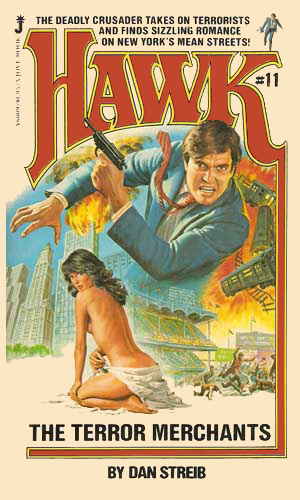 The main character, however, remains confusing as he seems to switch between 'deadly crusader' out to punish the wicked and a shivering coward afraid of shadows. 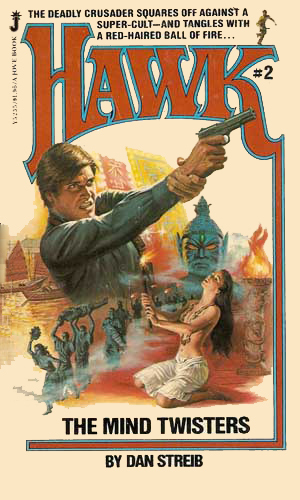 If you are mainly interested in action/adventure novels, you might try some of these. Otherwise, pass them by. 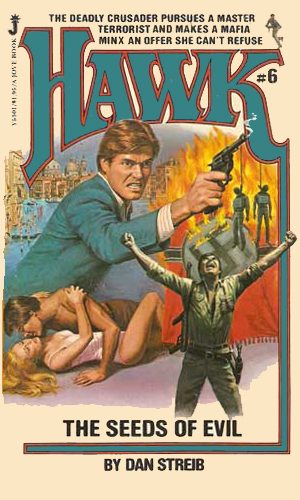 The first four novels in this series are good. They demonstrate Michael Hawks resilience and develop his fatalistic persona. Action comes hard and fast but story and character are not forgotten. There are moments of real excitement and exotica as well as some erotica and down-right nastiness. I'd read them over and over. Diminishing returns sets in with the remainder which excepting Down Under And Dirty are a fairly shabby bunch of exploitation thrillers which lack plot, style, substance and people. Disappointimng, but I mark it a B because those first four (especially 1,3 &4) cut the mustard for me.